It rarely goes by a name but Pi Ley inlet on the Phi Phi Islands impresses all that visit. Wedged in-between the cliffs of Maya Bay, Loh Samah and Viking cave it is one of the 4 key sites of Phi Phi Ley. 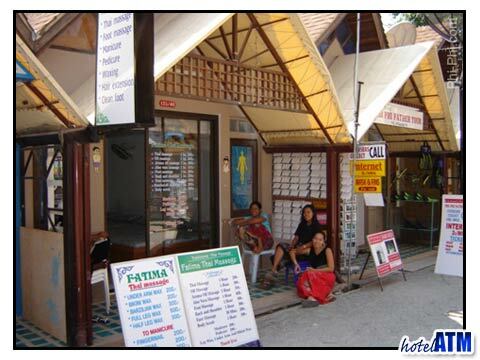 If you have been to Phi Phi Ley you will visited it. The Pi Ley is a fjord like and cliff-ed inlet. The hanging walls are covered with jungle trees and vegetation clinging to it's sides. The inlet opens out in the furthest part into a deep lagoon some 5 meters deep. At the entrance to Pi Ley there is a pretty coral reef that guards the lagoon at low tide. The reef has a varied mix of coral juveniles and colourful reef fish like the grouper, wrasse, moray eel, lion fish, angel fish, sergeant major and many more. Pi Ley is a wonderful place to visit and perhaps paddle a kayak close under the edges of the cliffs. In some areas, mainly by the entrance there are some large overhangs, ideal at the right tide to get out of the mid-day sun. There is a very rarely used Pi Ley beach right opposite the entrance. From here you can scramble and clamber up through 40 meters or more of steep jungle to a look out that takes you to the other side of the island. From here there is a vertical drop to the sea but spectacular sunset views out towards Phuket. There are many tours that take you to Pi Ley but not all of them take you inside or let you spend time here. The Phuket Phi Phi tour Cruiser is too large to go into the inlet but the higher deck probably gives you the best view of all tours of the entrance. 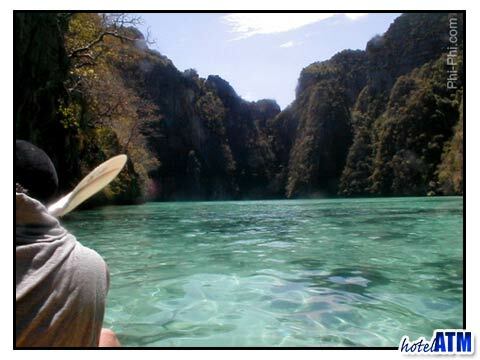 The Full Day speedboat tour of Phi Phi from Phi Phi takes you inside where you can swim in the lagoon and just enjoy the beauty. It also stops at the coral reef at the entrance. This tour and the longtail boat tours have the shallow draft to skim over the reefs and get to the lagoons. The Phi Phi Party Crew have a trip out to Phi Phi Ley which offers you the chance to kayak, swim, snorkel or dance. This is an afternoon evening tour designed for those 'in the groove'. The tour boat is a converted fishing boat or sometimes a ferry boat so it varies. However it is large enough for a group of people to hang out and party in a perfect setting. This tour will go round to The Beach in Maya Bayif the conditions allow. Pi Ley as a dive location has some interesting features. It is easterly facing and so gets the best sunlight penetration in the morning when most dives occur (West facing morning dives can be in the shade). On either end you have 15-20 meter wall dives and at the foot of the coral reef at the entrance you have a sloping, coral, boulder and rock terrain that offers good contrast. Pi Ley is protected by the big waves during the monsoon months and is always calm. For this reason it is more busy in low season when the weather is at it's most changeable.